So before you hop on this growing trend, let me share what kicked off this weekend in the fermentation part of our mini-vineyard. Let's start with a word of caution before you become all caught up like many do when they want to become part of a growing trend. If you think growing and making your home-made wine is all idyllic and beautiful, get yourself ready for an eye-opening experience. And while I realize there are far worse hobbies run amuck, growing grapes is only ½ of the equation and that, in itself, is a ton of work. 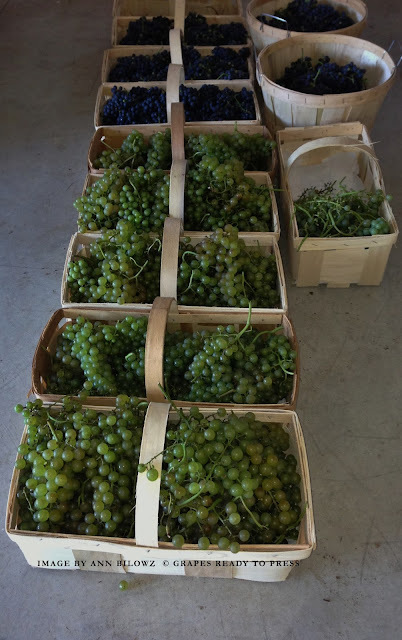 The image above shows a portion of the grapes harvested from our research vineyard and without sophisticated mechanical equipment, it is an extremely high, labor intensive process to getting the grapes crushed. That is if you want it ready for something drinkable and no impurities ruining your yearly crop. Joanne Harris’ quote provides some simple foresight. “A man may plant a tree for a number of reasons. Perhaps he likes trees. Perhaps he wants shelter. Or perhaps he knows that someday he may need the firewood.” And there you have it – we do certain things but maybe for different reasons. It could start off as a learning experience or a necessity that perhaps turns into, at least in the case of our mini-vineyard, a growing trend. Compare it to the example of the tree. Get prepared to take on some hard work, especially if its use is as firewood (or as in this case, wine). It’s a multi-step process. And yes, in looking ahead, it’s quite an adventure.